In the following article University of Tulsa historian Kristen T. Oertel describes the people who like John Brown helped enslaved African Americans in Missouri escape to freedom in Kansas Territory through the western Underground Railroad. African Americans have valorized John Brown throughout history, linking a white man to a pantheon of radical black heroes from Frederick Douglass to Rosa Parks. Delegates to the second Niagara Convention, future founders of the NAACP, designated “John Brown’s Day” in 1906 to commemorate Brown’s sacrifices for black freedom, and monuments in his honor have been erected in places like Western University, a now-defunct historically black college in Kansas City, Kansas. While admiration of Brown is well-placed, it often overpowers the acknowledgement of Brown’s black and white allies and complicates an understanding of their role in his abolitionism, particularly in Kansas, where Brown struck his first violent blows against slavery. Like the focus on Brown’s abolitionist martyrdom, studies on “Bleeding Kansas” often fail to highlight the ways in which black slaves and their white allies impacted the struggle between slavery and freedom that ensued on the country’s western border in the 1850s. 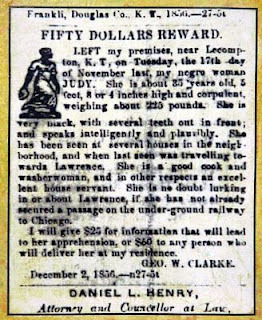 After the passage of the Kansas-Nebraska Act in 1854, thousands of antislavery settlers from Massachusetts, Ohio, and other northern states clashed with their proslavery counterparts from Missouri, Kentucky, and Alabama as both groups attempted to establish “popular sovereignty” in the region. 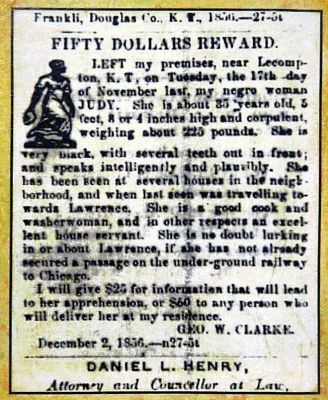 Some of these proslavery settlers arrived in Kansas with their slaves, hoping to expand the peculiar institution into the far West and determined to defend their “property” rights with strict slave codes and a proslavery territorial constitution.